Recommended by our favorite ear experts (audiologists!). The DS-600A fills your room with sound to mask tinnitus or distracting background noises. The easy operation lets you choose between 6 nature sounds and control the volume to what’s comfortable for you. Now you can enjoy the surf as it meets the sand on the beach, the soothing sounds of a distant thunderstorm, or the steady, constant background of white noise. Relax to a babbling brook, the gentle lapping water at the lakeshore, or the sounds of crickets and spring peepers on a country eve. 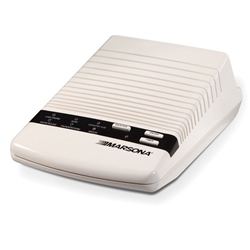 The Marsona DS600A also can be operated with four AA batteries (not included). So you can take it wherever you go: hotel room, camping, even in the car. The timer can be set to turn the unit off after 60 minutes.